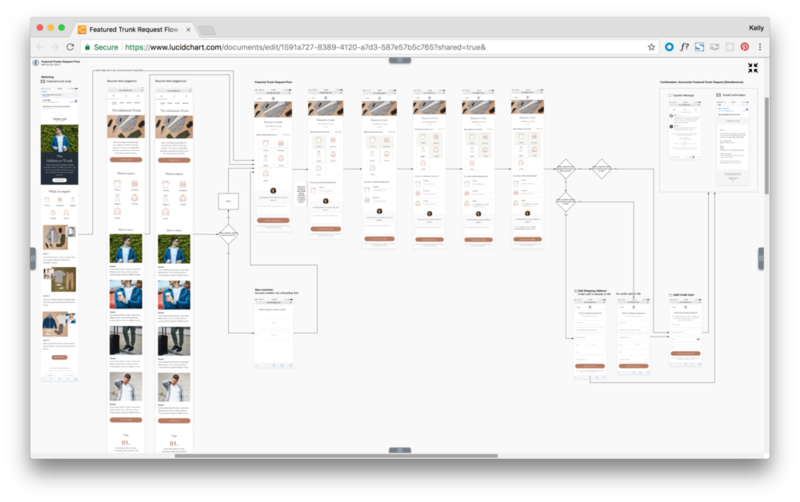 Leveraging user research to improve the customer-facing trunk request funnel within Trunk Club's featured trunks marketing program. When a customer receives an email with a featured trunk, it’s unclear how to request this trunk and what to do next. Do I talk to my stylist? Am I getting these specific items? Will the stylist send me everything shown? How do I communicate additional preferences to my stylist? Why is my only option to send a message? This confusion on behalf of customers has led to a precipitous drop in conversion rate from when we feature these campaigns in emails and in display advertising. Over a period of one month, 64% of men and 50% of women who clicked initiated a featured trunk request didn’t actually submit their request via messenger -- indicating that our historical approach to featured trunk requests doesn't properly set or align with customer expectations. Secondly, when stylists are notified that a customer is interested in something from a featured collection, there is much uncertainly whether the customer wants the entire collection, a specific item, and as a retail organization, we’re unable to track and ensure the request is being met, let alone attribute purchases directly to featured trunks as a marketing program. 24 hours after the launch of the revised featured trunk request flow, we saw 836 unique customer requests submitted to stylists. Within five days, over 2,000 featured trunk requests were placed by customers. To date, our marketing team attributes $25M to the overall featured trunks program, with continued iteration on the overall experience slated for 2018. Armed with initial insights, we hosted a cross-functional sketching session led by myself and another product designer. In the room were designers, product managers, engineers, and marketing stakeholders. Based on output from the sketching session, Danny and I developed three unique concepts to garner feedback from product designers, engineers, and after iteration, ultimately customers. After two rounds of review -- one with the product team and one with the engineering team, we were ready to make updates to our three concepts, build out high fidelity interactive prototypes, and begin recruiting customers to come in-house for usability testing. 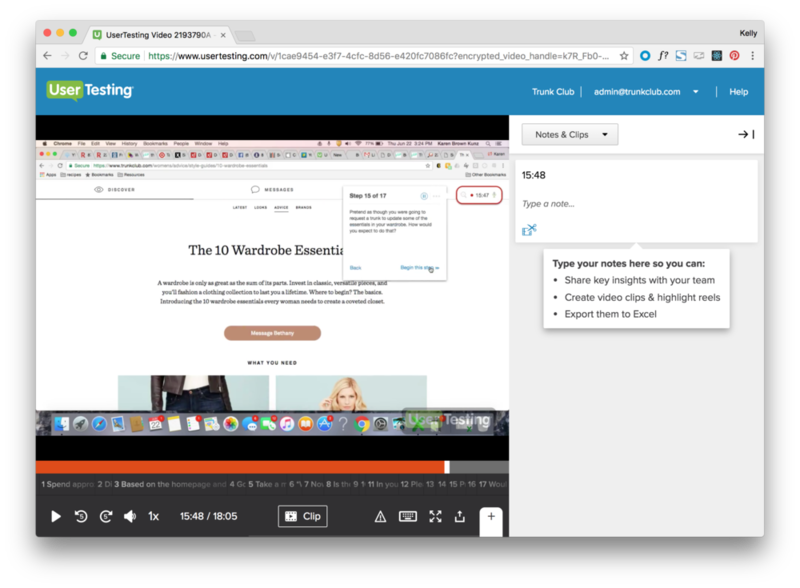 We recruited and screened existing customers to come into our office for moderated usability testing of our three unique concepts -- sending emails via Mailchimp and screening via Google Forms and a short phone call. The research plan included a moderator's guide, rainbow spreadsheet for participant note-taking, and counterbalanced flow of customers through each individual prototype as to avoid presentation bias. As part of the usability session, after interacting with the three prototypes, participants were asked to mark up print outs of the designs (red = things they disliked // green = things they liked). Findings were synthesized and prepared for a read out. This included our strategy for revising the overall experience to get to an MVP. The final prototype - Concept D - informed by in-person moderated usability testing. Final flow diagram prepared for engineering as development began.